Assignments in foundation courses of design institutes are commonly criticized as adhering to more of an artistic bent of mind and lack a methodical and scientific approach. This issue continues to be debated and leads to dominance of one kind of approach over the other. Most of the time, the discourse is predominantly about which approach is more effective for modern Graphic Design education, rather than suggesting empirical methods to create newer paradigms of design teaching. In the pursuit to balance both modes of thinking, (vertical + lateral), this book proposes a method towards criteria based education in Graphic Design. It means design of a teaching method which is goal oriented (to foster vertical thinking), as well as, open-ended; free for exploration (encourage lateral thinking). The aim of the presentation is not to prove that visual design principles are the basis of all arrangements in a visual space. There are many excellent books which have demonstrated and defined these principles quite elaborately. The attempt is to create a new method which encourages and engages an exploration of visual design principles by performance; to explore arrangements in collaboration with other students rather than in isolation. Isolation here refers to the act of working on the computer in front of the screen, most of the time struggling with the tool instead of focusing on the task. This presentation aims to encourage students to make conscious design decisions while creating an arrangement. It also aims to instill objectivity and anticipation during creation and to validate the anticipated by testing it with the audience or viewers. This presentation hopefully makes it evident that all visual decisions made by a graphic designer, while arranging elements (in this case, type/letterforms) within a two dimensional space are not just intuitive and imaginary. In fact, these decisions are also objective, rational and dictated by the need of the message to be communicated. It is on my agenda therefore to create the necessary awareness that if these design decisions are misunderstood then they get labeled as whimsical and irrational, most often by novice designers attempting to discern the principles of visual design. The objective of this presentation is to introduce a method that encourages collaborative environments for learning, where physical participation, dialogue and involvement with a purpose (task) are of prime concern. This experiment is an attempt to balance the future of design education, namely traditional and modern ideas, through recognizing and associating rational thinking with exploration and creativity. This presentation attempts to explain principles that govern the creation of Visual Order (hierarchy). Visual Order is addressed in the context of relationships between elements which coexist in a two-dimensional space. The objective is to internalize an experience by creating Visual Order; a planned arrangement which allows perception of the desired meaning. When one meditates, one experiences meditation for the self. This experience of meditation can only be told to someone with help of an analogy. If someone has to experience the experienced, it can only be internalized by doing (i.e. meditating). If ‘doing’ is bound by limitation of time, then the act is imitated with help of analogies. Analogies help us understand the reality. Therefore, to begin the process of learning, an experiment was formulated to understand visual design principles through creation of analogies. These analogies were further mapped to actual (real-world) design tasks through comparisons and discussions that were initiated by the instructor. 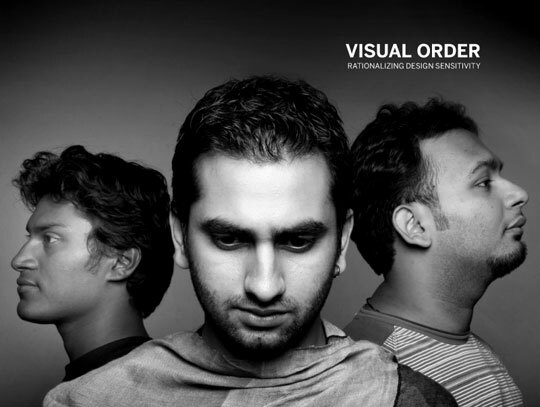 The experiment was conducted over a span of four to five years across various design institutes and has manifested itself into a teaching method documented in this presentation titled, Visual Order.